If you are part of our Facebook Group, you may have already heard about the new changes that Facebook is making to its APIs. Facebook has been under fire for how it handles users’ data. In order to make their platform secure, they have announced a number of changes recently. Some of these changes affect how RecurPost (and other scheduling apps for that matter) works. The biggest change is in terms of how we post on personal Facebook Profiles. You can no longer schedule posts on Facebook Profiles. Well, you can no longer schedule posts so that they get posted even when you are sleeping. However, unlike most other tools RecurPost has got your back. We have made some changes to our process to let you still post on Facebook profiles. We allow you to post via Push Notifications. When it is time to post, we will send you a push notification. As you click on it, we will copy your message in memory and show you the Facebook post dialog. Simply paste your message there and you will be good to go. If you use your personal profile for business exclusively, you might want to consider converting your profile into a page. Here is a link from Facebook that explains this further. Another big change from Facebook is how RecurPost connects with Facebook. 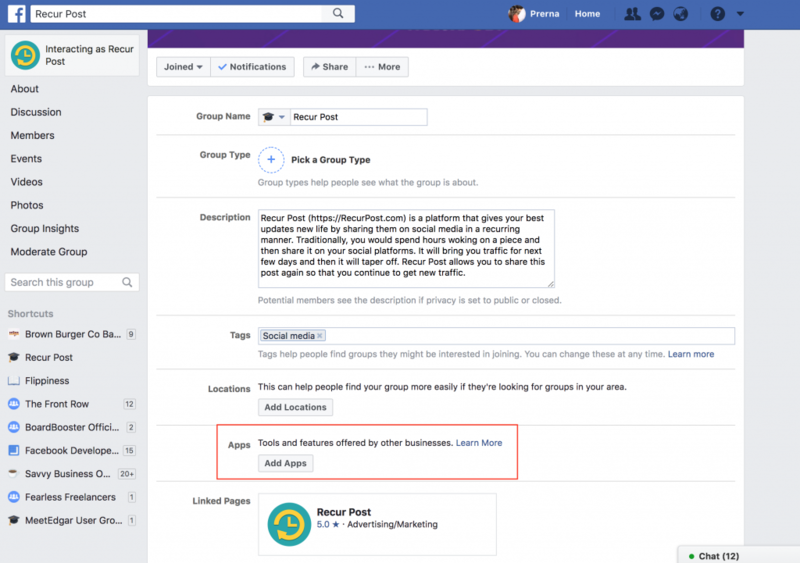 It does not change anything for Facebook pages, but you need to install RecurPost app on your Facebook groups and then reconnect them on RecurPost. 2. On the settings page click on Add App button and search for RecurPost app. Once you add it you will be able to post with RecurPost just fine. Until you install RecurPost app on your group you will not be able to post on your groups. Please do that right away to avoid any disconnection. Don’t forget to get our latest apps for iOS and Android to enjoy posting on Facebook profiles.